Interests - MSN, Hannah Montana and dancing. 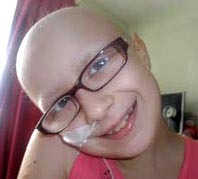 Holly was diagnosed with Neuroblastoma in February 2009, she has been through a lot of treatment and been fighting it. However today they were told that the current chemo (TVD) isn’t working and there are no more options left. Holly is currently is in hospital but they are trying to get her home so she is with her family, and kept comfortable. Holly is 12 and so understands what is happening, how ever please keep post upbeat and cheerful. She loves getting post and so lots would make her smile! Her sister is called Izzy and is 3 and her brother Harry is 1. I’m very sad to say Holly passed away at 4.22am today holding her Mum’s hand. As Holly cannot walk she came home in an ambulance. Blue lighted to avoid the traffic, it is a shame she is so poorly because she would have really enjoyed that. She was more concerned about being dropped by the two lovely ambulancemen carrying her up the stairs! Once she was in her own bed her agitation eased and she seemed to sink into her pillows with relief. She is very weak and totally exhausted. Her nose seems to be permanently bleeding as are various other parts of her body. Her platelets are now non existant so her blood isn’t able to clot.